It’s normal enough to see drunk students hanging off of tree branches (isn’t it? ), but what about small rat-like creatures? It turns out that wild mammals may also be behaviourally and physiologically challenged by alcohol in their food. 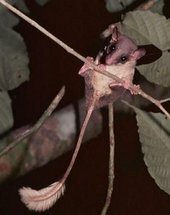 Frank Wiens and colleagues recently discovered that pentailed treeshrews (Ptilocercus lowii) and 6 other mammalian pollinators of the bertam palm (Eugeissona tristis), chronically consume alcoholic nectar from the palm’s flower buds. The buds harbor a fermenting yeast community which facilitates the production of nectar with the highest ever alcohol concentration reported in a natural food. Their study in a West Malaysian rainforest found that the pentailed treeshrew spends around 2 hours consuming the equivalent of 10-12 glasses of wine with an alcohol content of up to 3.8% every night! "Pentailed treeshrews frequently consume alcohol doses from the inflorescences that would intoxicate humans. Yet, the flower-visiting mammals showed no signs of intoxication," they report. This suggests that there must be some adaptive benefit to a diet high in alcohol and strong selective pressures for combating the adverse effects seen in humans (e.g. cell and organ damage and altered neurobiological performance). As the pentailed treeshrew may represent the stock from which all extinct and living treeshrews and primates radiated, Wiens and colleagues conclude that exposure to potentially harmful alcohol levels was probably significant early on in the evolution of several mammalian lineages, including treeshrews and primates. It seems these pentailed treeshrews have higher levels than humans of the alcohol metabolite ethyl glucuronide, indicating that they may be breaking down the alcohol by a pathway that is not used as heavily by humans. This keeps concentrations of alcohol in the blood and the brain low. Some of the mechanisms involved in maintaining a positive evolutionary fitness balance of alcohol consumption in pentailed treeshrews may eventually help combat human side effects related to alcohol abuse. Maybe a good few PhD projects for those students! Frank Wiens, Annette Zitzmann, Marc-André Lachance, Michel Yegles, Fritz Pragst, Friedrich M. Wurst, Dietrich von Holst, Saw Leng Guan, and Rainer Spanagel (2008) Chronic intake of fermented floral nectar by wild treeshrews. Proceedings of the National Academy of Sciences of the United States of America 105 (30), 10426-10431.